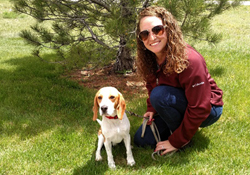 Amy is the handler responsible for our bed bug dog, Tracker, and she is a Colorado native. She grew up in Colorado Springs, then moved to Greeley to earn both her Bachelor’s and Master’s Degrees from the University of Northern Colorado. Currently, she lives in Northglenn with her husband, two children, and various pets. Amy has loved animals (especially dogs) from a young age. 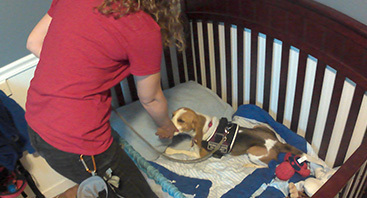 She became interested in bed bug detection dogs after her husband started a pest control company. Becoming a handler to a detection K9 blends her desire to help people and work with animals. Tracker our bed bug dog! 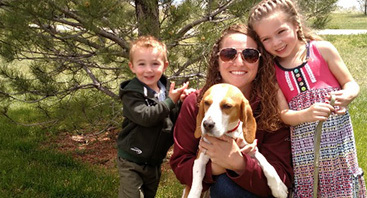 He is a Beagle who was extensively trained in Hesperia, California by animal trainer Stephanie Taunton. After passing his scent detection training, Amy traveled to California and spent a week in training with Tracker. She was immediately blown away by his intelligence, dedication to working, and accuracy with finding bed bugs. His big floppy ears and spunky personality helped too! Tracker loves his Colorado life. When he isn’t working, he can be found playing with his brother dogs, his two children companions, camping, or sniffing out treats!